Get the most out of your vacation in the Allegheny National Forest region with a knowledgeable, experienced local tour guide. Tour the area with a guide to maximize what you can see and do while visiting our region. Meet Dale at his location in Bradford ride in his transportation to visit the Forest, scenic overlooks, the Kinzua Sky Walk and other local attractions. Also available as a step-on-guide service for motorcoach tours. The Kinzua Fly Fishing School on 44 Parkview Avenue in Bradford Pennsylvania, has been teaching fly fishing classes within the Allegheny National Forest Region for 23 years. Book a two or three day session in the heart of the Allegheny Mountains and learn fly tying, fly casting, and fly fishing techniques, with nymphs, wets, streamers and dry flies. All beginners and intermediate anglers ages 12 and up are welcome. 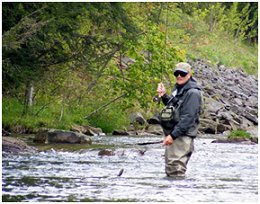 Let the experienced Kinzua Fly Fishing team teach you new skills, without the headaches and frustration that often go hand-in-hand. Kinzua ADVentures on 204 Bolivar Drive in Bradford, Pennsylvania, offers winter excursions by snowmobile during the snow season, and during the spring, summer and fall, four different guided tours by motorcycle, along with boat tours of the Allegheny Reservoir on a 21-foot jet boat. Book a special outing that is tailored just for you with Kinzua ADVentures and live this once in a lifetime opportunity to see and experience our area as only locals can. Four exciting motorcycle tours, with each ride being approximately 150 miles through the rugged beauty of the Allegheny National Forest Region are available. Boat tours are approximately three hours in length, on the Allegheny Reservoir, where you can view the stunning vistas around the Kinzua Dam, the marinas, and depending on the water level, a boat ride up the Allegheny River.